Francis Campbell Carter : Building an Outrigger Canoe, 1912. 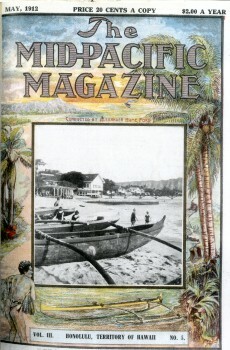 Carter, Francis Campbell: Building an Outrigger Canoe. Volume 3, Number 5, May,1912, pages 438 to 44. 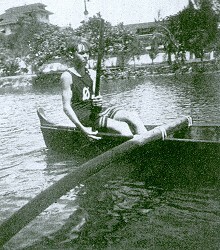 Several comments and photographs are centred on the Outrigger Canoe Club, Waikiki. A Catamarran and Two Outrigger Canoes. Every island or group of islands almost, in the Pacific, has its particular type of canoe, and all, with the exception of the Solomon Islands and the Maori canoe, are built with outriggers, those long pieces of log parallel with and connected to the canoe by long sticks or poles lashed to the thwarts of the canoe at one end, and to the parallel log of wood at the other. These outriggers help to keep the canoe on an even keel, and while ntshing before huge breakers this attachment prevents the frail craft from being swamped. The parallel log of wood may be at any distance from the body of the canoe, from three feet, as in Samoa, to a dozen, as is sometimes the case in Hawaii, where the surfing canoes are forty or more feet in length. The general plan of the Hawaiian outrigger is easily studied in the drawing and this is the best and easiest model to construct. For a canvas canoe it is best to secure a light log - the lighter the wood the better - about six inches in diameter, with ends turned slightly upward. If the canoe is to be used for riding before the waves, the ama, or parallel stick, should be far from the canoe; if for racing purposes, it should be drawn closer. In Hawaii the iakus (the sticks connecting the awa with the canoe) are made from the hau tree, and the down curve at the ama end is usually natural; however, any kind of soft wood that can be bent easily will do. 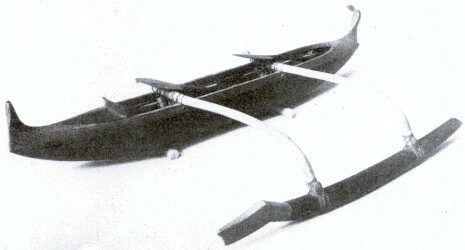 The curved end of the iaku is bound to the ama with heavy cord, the straight end to the gunwales and thwarts of the canoe. It is best to have seats under the iaku and on these a block of wood about two inches wide from one gunwale to the other, this block to be lashed by cords to the seat and thwarts. The iaku is then lashed to this. ... through the gunwales on either side of the spot on which the iaku will rest: and the heavy cording is passed through these in lashing the iaku to the canoe. 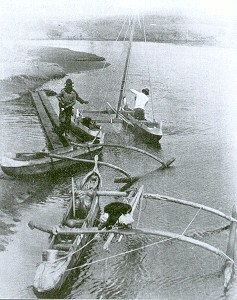 After the lashing is accomplished, merely sprinkling the cords with water will bring iaku and canoe into closest contact. The bending of the iakus to the canoe should be accomplished first, canoe and ama, however, lying on level ground parallel to each other. It can then be judged which iaku it is necessary to use at the bow to raise that end of the ama slightIy. It may even be necessary to put a bit of wood between the iaku and the canoe gunwale to effect a proper elevation. One person should easily lift the finished craft sufficiently for laullching by merely grasping the iaku in both hands near the body of the canoe, on the outrigger side, and lifting, then dragging. If there are rocks to cross, it would be better to man both iakus and lift the canoe clear. In launching, the bow should pointed seaward and be kept so, for if the canoe broaches to the waves and fills, she is liable to pound on the beach. In landing, unless the waves drop vertically to the strand, it is best to rush headlong before a wave, which will usually leave the canoe high and dry on the beach, then all that is necessary is to leap out, grasp the fore iaku near the canoe, lift and drag the canoe above high water mark. The guiding of an outrigger canoe will be learned only through practice, the stroke that would send an Indian canoe forward would cause the outrigger to describe a circle. Larger, wider and stronger paddles are used and the harder the wood the better. The helmsman sits at the very stern and steers with his wide-bladed paddle parallel to the canoe, pulling the handle toward him with a quick, even stroke, or placing the blade in the water and pulling the stern of his craft toward it. To catch a wave, he selects a long roller, gets before the uproll while it is forming and paddles forward with all his might. If he is to catch the wave, the rising hill of water raises the stern of his canoe while the bow points down to the hollow, and the mad onrush begins. Once the wave is fairly caught these (sic, there) is little danger of its rising above the crest and sinking back - the skill now is to keep the canoe that is pointing downward straight on her course. ... and the wave lost, if to the off side, swamping is the penalty. The rush of water is so great that a paddle dipped sideways in the water is instantly torn from the grasp and skill is needed in keeping the blade edge on. his place to rock the boat downward if there is danger of slipping back over the crest of the wave. The man amidships must be prepared to run out on the outrigger should it begin to lift from the water, or if it begins to submerge itself, lean as far as he can in the opposite direction. One man \vho is skilful can handle a small outrigger canoe in a heavy surf, but two, three or four are better numbers, it being safer for swimmers in the deeper waters where the long rollers form. At Waikiki Beach, Honolulu, where a club of several hundred keeps outtrigger surfing sports alive there is a run of a mile from the outer breaker to the beach. The speed of the canoe is forty miles an hour, and as the water is 76 the year round the sport is indulged in at all seasons. In fact the Outrigger Canoe Club pulls off several events every year and some of the races are often contested by as many as a dozen canoes that have canght the same great roller and sweep at express speed toward the beach. The Hawaiian canoes are native mahogany dugonts to which the outriggers are bound, but sometimes the canvas canoe is adapted for surfing. To sail an outrigger canoe, the craft is turned stem to bow, the iaku near the mast hole lengthened on the off side by splicing or binding to it a bit of pole three or four feet in length, to the end of which the halyards are made fast. The steering is done with the broad paddle, the sheet rope being help between the second and big toe of the helmsman if there are but two occupants of the canoe. The other man is stationed, standing, at the mast, ready to run out on the outrigger if a squall lifts it from the water or to lean in the other direction when necessary. Sailing races usually start from the beach, the canoes all drawn up, two men to each, on the strand; as the signal gun is fired, the canoes are launched, turned around toward sea and away they go. It is permissible on the return, to catch, if possible, an incoming wave and coast before it. How the White Boy Builds the Outrigger. ... way the last becomes first and the first last. There are thrills in surfing with the outrigger canoe unkown to the ordinary craft, and as all ordinary canoe may be turned into an "outrigger" without any particll!ar trouble or skill, the only requirement being a ball of twine, two young saplings and a log of wood, there is no reason why the sport should not be introduced on both our Atlantic and Pacific coasts. Along the Southern California coast and everywhere on the Atlautic seaboard there are places where the outrigger canoe might become quite an addition to the water sports. North of San Francisco, on the Pacific, the waves are so gigantic and the water so cold, that only skilled surfboatmen should make the attempt and even then large boats should be used. A youngng Hawaiian did make the attempt off the Oregon coast, and with success, but a fatal accident caused him to abandon the sport in such tremendous surf. He had built a special steel cylindrical ama, pointed at the ends, and his companion in the canoe was warned not to jump out in case of an upset, on account of the steel ama. His companion, however, unfortunately lost his head when a giant wave rose behind the craft, leaped forward, was Struck by the pointed steel ama and killed. No accidents have ever been recorded anywhere when ordinarv cautions were observed. While the Hawaiian outrigger is the best and simplest in use on the Pacific, it may be well to give a pattern of the general type of the South Sea Island outrigger, with its several "iakus," the off ends of which rest in crutches crudely built on the upside of the ama. Perhaps the form of outrigger canoe shown in one of the photographs will be easier for the small boy to construct, and if he wishes to use his canoe for fishing purposes, he may even build a platform a foot or two wide along the iakis, parallel to and near the canoe. On this he can stow his nets, and if he wishes to build an awning above, may sprawl out and sleep. How to Lift an Outrigger Canoe. Geoff Cater (2011) : F. C. Carter : Building an Outrigger Canoe, 1912.